Competition and Masterplan, 2014. In collab with soma ZTGMBH. 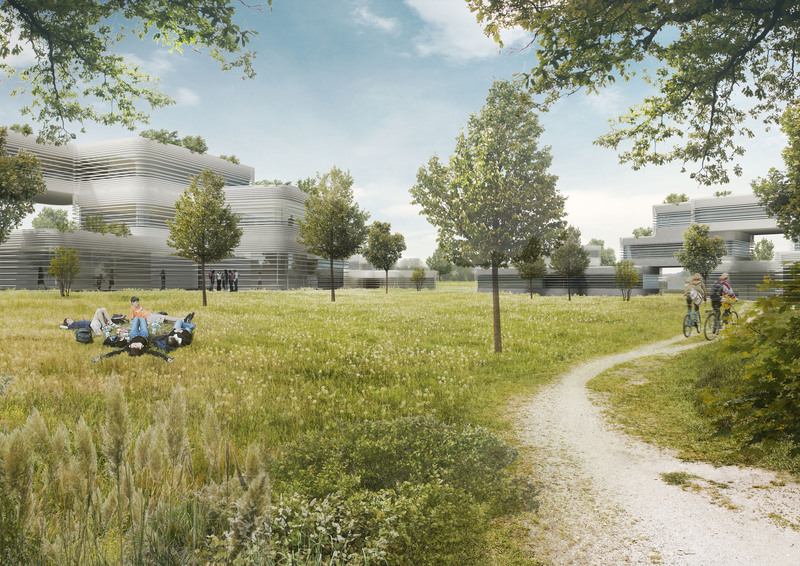 The master plan of the Centro European Leadership Academy projects the landscape at the site in Vištuk to define new spaces for the boarding school by keeping the principal quality of the original field: generous open space. We understand this field as a term describing the place of continuously varying character, without sharp boudaries, associated with oversight, spaciousness and freedom to roam. In architecture the term is also associated with topics of landscape, ecology and urbanism. Nevertheless we also use the field as a concept requiring the use of forces rather than matter, gradients instead of sharp distinctions, multiple interrelated elements in the place of a few objects. By gradually adjusting to the forces of this field (with its smooth topography, gradient of zones and gradiose views), we try to achieve a magical connection between architecture and landscape. To identify with a place primarily means to be open to its character or ‘genius loci’ and to have a place in common means to share the experience of the local character. To respect the place, finally, means to adapt new buildings to this character. Architecture means to visualize the ‘genius loci’, and the task of the architect is to create meaningful places, whereby he helps man to dwell. Composition was not tied to place but to some external circumstances which one could consider as Zeitgeist phenomena – so the vertical surface, the facade, was representative of the place [(genius loci)] whereas the plans were indicative of an evolution in time. Based on an interpretation of the Zeitgeist has an index of development in time, we decided from the onset to look at a specific process of campus development. 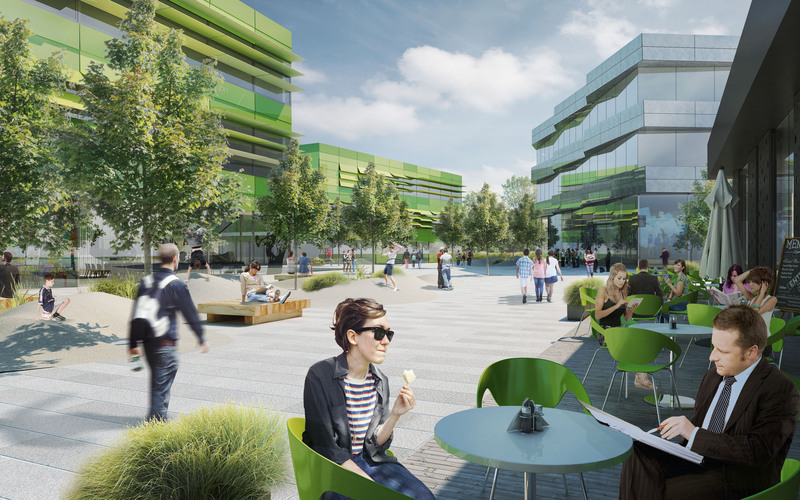 The Campus should grow not only in area, but also in-depth, bye Krajčovič differentiation and specification of spaces analogically to added memories for each new class: the older students will always recognize the spatial structure of their academy, but during reunions they will be surprised by the added resolution of differen known spaces. 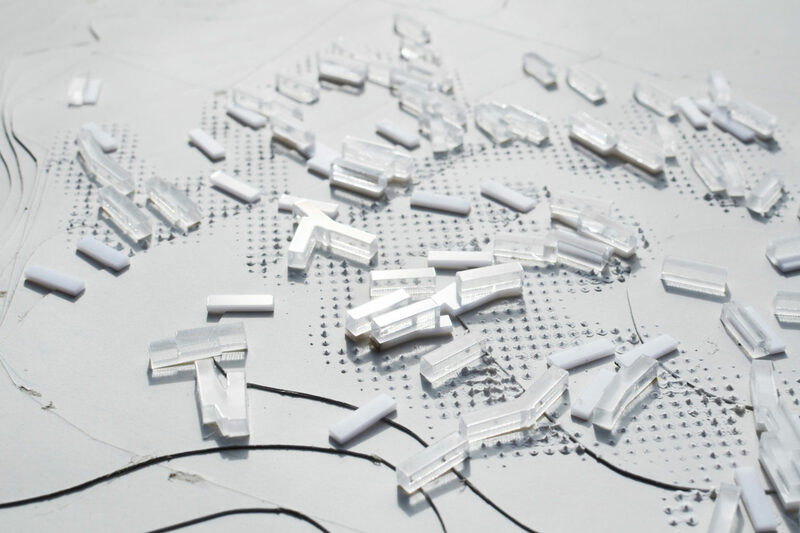 We propose a process of cultivation for the field, and the transformation of its fragments into more precisely designed quarters, following a gradual transition from agricultural to architectural and urban culture. for the entire community. 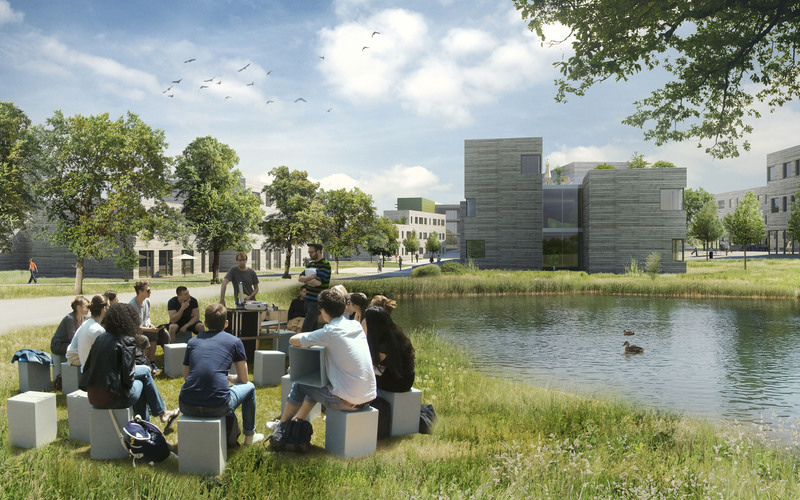 The project allows participatory development of the campus and its surroundings, while also providing inspiration and reference for future projects of students through it’s innovative and special spatial quality. The outcome will be a poetic campus, in the original sense of poiesis as creation, but also in the sense of poetically layered memories that will be inadvertently triggered through association with a specific texture or view, emerging even after years to remind us of the comunity where we cultivated our future. All academic buildings are connected throught the main paved space around which the two main groups of buildings cluster for each of the large 1200 student phases. This is a space of shared traffic modes that allows a safe walk between classes by prioritizing pedestrian movement and only allowing exceptional car traffic. It is located at the crossings and along the main academic boulevards. 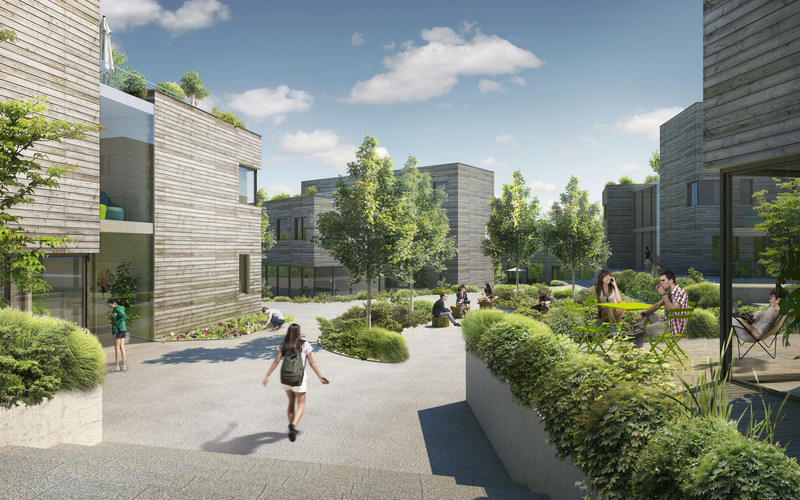 Each of the dorm clusters housing 200 students has an open space of its own, fostering a sense of comunity among its visitors and allowing a healthy identity and competition in relation to the other 11 clusters. The clusters can be variably programmed, including terraces for dining, playgrounds and relaxing amenities or group seating for studies. All buildings are connected to the landscape trough perimeter gardens. At their edges, mostly in Southern or South-Western orientation, rows of trees provide summer shading and cooler microclimates, while allowing low-rising sun to shine through barren wintery branches.